The last day of training before I really kick back on my taper. To start it I planned to swim the whole course. Nick decided to join me for the longer effort and a chance to see what we’ll be doing next Saturday. It’s a long way out there, but with the number of athletes rising I didn’t think it would be lonely. In contrast to the warm, sunny start to the day the water in the bay was cool from yesterday’s rain. It wasn’t till you’d passed the end of the pier you started to warm up. 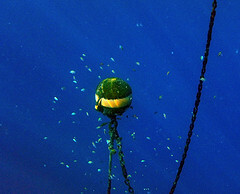 Nick and I made good time to the final orange buoy getting there in about 15 minutes. I’ve been pleased with my swimming since I arrived so was keen to see how quickly I could make the far turn. We paused briefly before heading out into the unknown. 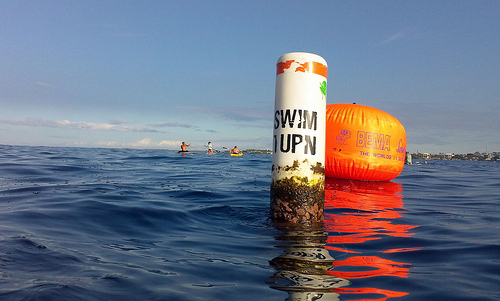 There were more swimmers out on the course, but there’s nothing to sight to the turn buoy. Dodging the occasional swimmer coming the other way was all that assured me I was on course. A small group of paddle boarders appeared on the horizon and I homed in on them assuming they were at the buoy. Nick and I arrived having taken over 20 minutes for the second quarter! Neither of us are the fastest swimmers, but we must have weaved a long course. We floated there a little longer taking in just how far back we had to go. No use putting it off I hoped targeting the mobile mast behind the pier would keep us on a straight path home. I seem to repel the sea life in Kona. When I reached Dig Me beach a swimmer came up and asked if I’d seen the dolphins. Nope! I’d seen a couple of big fish (and I’m sure they’re fish from their fins), but nothing else. Nick arrived excited that a pod of dolphins had passed within twenty metres. I’d been completely oblivious! Swim done it was off to Bongo Ben’s for its Sunday buffet breakfast. Last year I’d seriously indulged and taken the entire day to digest the meal. This year my goal was to moderate my eating so I could actually follow my training plan. I’ll spare you photos to avoid this blog becoming a diary of Kona breakfasts! Moderation was successful as I comfortably walked back to the hotel after my meal. Within an hour I headed out for my final bike session another attempt at two twenty minute threshold efforts. After Saturday’s improved ride I was more optimistic about how things would go. RPE and heart rate were on target, but my legs weren’t. I think the impact of riding hard the day before was still in them. Overall I more evenly managed my effort over the intervals, but neither hit the mark. Conditions were windier and far hotter on the Queen K reminiscent of last year’s race. I’d taken a single bottle with me and emptied it half hour from the hotel. I clearly underestimated the fluids required for the ride and got home feeling wasted. I postponed my run in favour of rehydration. It took at least three litres of fluids a clear indication of how important hydration is in this race. Get behind on the bike like I did today and you’ll suffer on the run. The volume of fluid I had to consume would make running very uncomfortable. On my quest for hydration I learnt the merchandise shop in the King Kam had opened. As a return competitor I’ve got all the merchandise I want, but it’s always interesting to check it out. It’s amazing what the Ironman logo is applied to, whether it’s cookie cutters or dog leashes! All that said I thought the T-shirt designs were a big improvement on the previous year. I finished the day with some practice for next week meeting with Steven for coffees on Ali’i Drive. Kona may be known for its coffee, but there’s only one or two places I’d really rate. Our first stop at Kope Lani is definitely the highlight especially when the owners remembered us from last year. As the sun set I decided to get the run in and avoid temptation tomorrow. Conditions were much cooler making for a pleasant run round to the Queen K and back down Palani. Spots of rain were in the air helping keeping the temperature down. Within minutes of returning those spots turned into a torrential down pour. I’d timed the run perfectly. Swim, bike and run complete the taper begins. I’m looking forward to more time to relax and enjoy Hawaii. There’s plenty in my schedule for the coming week and a lot to manage on the Kona social calendar. The main thing is no more hard work to be done till Saturday.